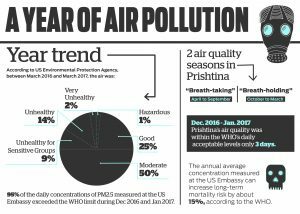 Beyond winter’s staggering pollution peaks, there is another crucial data point we should focus on: the 2016 air quality average, which reveals a significant threat to public health in Prishtina. In March 2016, the US Embassy started to collect air quality data for the first time in Kosovo through the US Environmental Protection Agency, EPA. Nothing new, one would say: Kosovo’s Ministry of Environment and Spatial Planning has been measuring air quality in eight locations throughout the country–including the urban centers of Prishtina, Mitrovica, Peja, Gjilan, and Prizren–for years. But for Prishtina citizens, the initiative of the US Embassy brought about accurate air quality information in real-time. 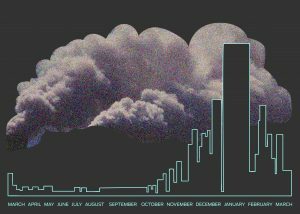 Thanks to the EPA, we had a chance to follow the evolution of air quality in Prishtina hour after hour, day after day, and finally put data to what we could feel but not see. The level of Prishtina’s air quality varied a lot during the past year: “Good” only 25 per cent of the time, mainly “Moderate,” but too often “Unhealthy” or even “Hazardous” to breathe. And the recent improvement of Prishtina’s air quality should not trick us: the air we breathe in Prishtina is, on a yearly average, simply bad. During the past 365 days, the US Embassy collected and shared air quality data based on a unique but quite representative parameter: the concentration of particulate matters that are smaller than 2.5 microns, which predominantly affect our respiratory and cardiovascular systems. These particulate matters originate from various types of pollutions sources – from the burning of coal, wood and most other materials to motor vehicles – and therefore constitute a good measure of air quality as a whole. This is especially true in winter, when NO2 concentrations measured by volunteers in Prishtina streets exceeded EU and WHO limits almost by three times. The ‘triangle’ between the bus station, Grand Hotel and the Sunny Hill neighborhood appeared to be the area most affected by NO2 pollution in Prishtina. The measurements from the Science for Change Project have the advantage of providing geographical and seasonal information regarding one important air quality factor, but the measurements are not made on a continuous basis. If you look for real-time air quality information online, you might come across the website of the Prishtina Municipality and find air quality measurements for six different locations in the city. The information provided by the Municipality looks quite comprehensive, covering seven air quality parameters as well as temperature and noise levels. However, data published by the Municipality on the concentration of dust in the air was inexplicably much lower than the US Embassy’s EPA data during the winter pollution peaks last year. Last week on the Jeta ne Kosove television programme, Prishtina Mayor Shpend Ahmeti stated that this difference in air quality information delivered by the Municipality and the US Embassy resulted from the location of the latter, as the neighborhood of Arberia is more exposed to air pollution. This argument was mirrored last January by Dr. Letafete Latifi, Director of the Hydrometeorological Institute of Kosovo, HMIK, during a debate on air quality organized by the EU Office Kosovo. “The US Embassy is located in a residential area more exposed to the pollution from Obiliq coal-fired plants and where wood or coal burning is commonly used as a heating system by households,” she said. Yet even the Prishtina Municipality’s measurements are still lower than additional measurements by HMIK, less than 500 meters away from one of the Municipality’s monitoring devices. For instance, when HMIK recorded the maximal concentration of micro-particles of the month on November 17, 2016, the Municipality published concentration levels five to seven times lower, indicating therefore that air was “Good” to breathe. Until that happens, residents and experts must make do with the US EPA’s data, which remains today the most accessible in depicting day-to-day and annual air quality trends in Prishtina, despite the Embassy’s more limited measurement location. Taking into account US EPA data, Prishtina has two air quality seasons: the ‘breath-taking’ season and the ‘breath-holding’ season. From April to September 2016, air quality in Prishtina was either qualified as “Good” or “Moderate.” Those who experienced the dusty streets of Prishtina in summer might not agree, but the months of June, July and August apparently constituted the best time to breathe fresh air in Prishtina. It is important to note that the micro-particles we are talking about – smaller than 2.5 microns – originate primarily from combustion sources such as wood and coal burning or car exhaust pipes, and not the transformation of mud into dust, which corresponds to another type of micro-particles that are not measured at the US Embassy. After quite a “Good” summer in 2016, October brought the ‘breath-holding’ season: suddenly, Prishtina’s air was only “Good” to breathe less than 10 per cent of the time, and the WHO daily guideline – 25 micro-grams of micro-particles per cubic meter – was exceeded every other day. December and January saw the worst air quality measurements of the year. During these two months, the concentration of micro-particles measured at the US Embassy exceeded the WHO guideline 57 out of 60 measured days. Today, air quality is getting better in Prishtina. The suffocating smog and “Hazardous” air quality seem to belong to the past. According to Mayor Ahmeti, the air improved following the circulation of Prishtina’s new, more eco-friendly public buses. Unfortunately, this is just a seasonal coincidence: mild spring breezes that push away pollutants and the reduction of household heating contribute to the improved air quality. The real impacts of Prishtina’s 30 new buses on the city’s air quality are still unclear, but a significant reduction of traffic pollution would also require a widespread regulation of road traffic. Until then, the annual picture of Prishtina’s air quality is still not “Good” enough to take a break and breathe calmly – at least in Arberia. According to the US EPA, the air exceeded WHO daily limits every other day during the past three weeks. The high variation between winter and summer should not be taken at face value. Beyond the staggering air pollution peaks of the winter, there is a crucial data point that we should focus on: the annual air quality average. When it comes to micro-particles smaller than 2.5 microns, the air breathed by Prishtina residents during the past year exceeded the WHO’s annual limit up to three times in the city center, according to HMIK for 2016, and up to four times in Arberia, according to the US Embassy’s measurements from March 2016 – March 2017. According to the WHO, such high annual concentrations of micro-particles may increase long-term mortality risk by up to 15 per cent. Dr. Antigona Dervishaj from Kosovo’s National Institute of Public Health, NIPH, cited a study conducted by NIPH from 2010-2012, which argued that reducing Kosovo’s air pollution would save lives. “A diminution of 5 ug/m3 of the average concentration of particulate matter in the air [about ten to 20 per cent less than today’s levels] would save 33 lives a year, and extend a Kosovar’s lifespan three and a half years on average,” she said.